When you want to cool a can of soda (or beer) quickly, what do you do? Stick it in the freezer! Wait a little bit and then boom, bang, icy deliciousness. We all do this. 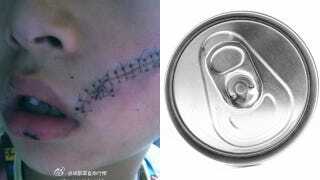 We don't expect the can to explode in our face and cut us up until we need 38 stitches like this poor boy in China. According to RocketNews24, a boy in China took a frozen soda can straight out of the freezer and when he pulled back the tab, the can exploded and sent aluminum shrapnel straight at his face. It was a serious injury that required 31 stitches to his face and 7 inside his mouth. Yikes! How did this happen? Well, water (which makes up most of soda) expands as it freezes so it takes up more space inside the can. And since a soda can is only designed to hold a limited volume of high-fructose corn syrup juice, the freezing effect can push against the physical constraints of the can. Once the container can no longer um, contain the volume of the content, it'll break. The boy was probably unlucky in that when he opened the can, it was the exact moment the pressure inside the can was too much for the can to handle—thus the explosion and thus, the sharp aluminum edge slicing his cheek.